The Brief Relief™ Disposable Urinal Pouch provides a safe and convenient alternative when nature calls. The bags can be used by both men and women. Our proprietary blend of naturally bioactive polymers and enzymes instantly turn urine into a deodorized gel. The funnel design and one-way valve prevent accidental spills. 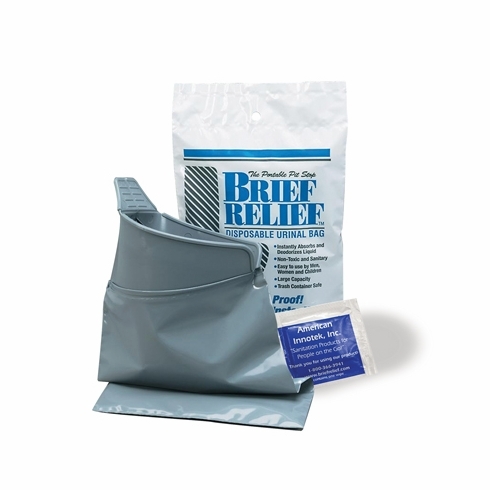 Designed with military standards in mind, Brief Relief even comes complete with a high quality sanitary towelette for clean up after use. Safe for disposal in any trash receptacle, Brief Relief™ answers the age old question - Where do you go…when you've got to go….but there's no where to go? •	Brief Relief™ in your vehicle glove box…….Just in Case!